Cyberport believes in the potential of Hong Kong’s burgeoning tech talents and supports entrepreneurs and dreamers alike. Therefore, the Cyberport Digital Tech Internship Programme (CDTIP) is designed to provide opportunities for students who are enthusiastic about innovation and technology. The interns will engage in a field experience with an opportunity to learn with an entrepreneurial spirit. In 2019, there are three tracks of internship programmes – FinTech, E-sports and Smart City. You are most welcome to join the Cyberport Career Fair on 2 March 2019 to grasp first-hand information. 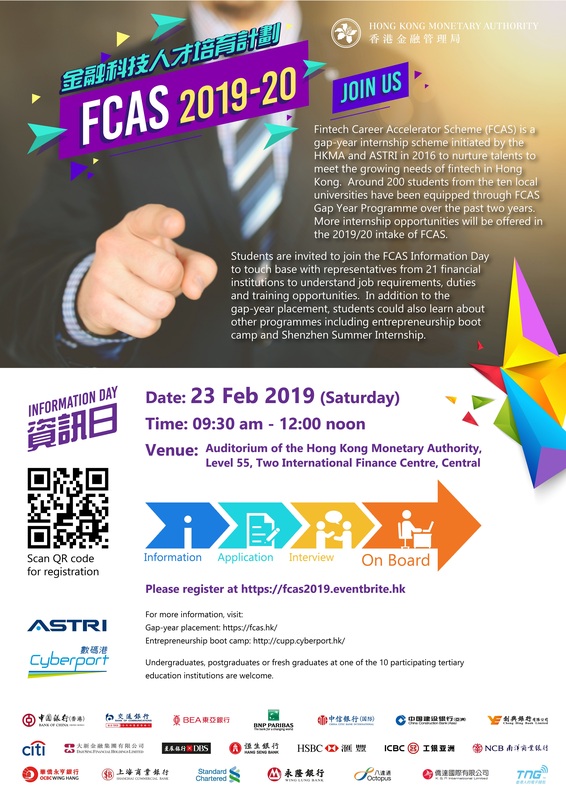 In collaboration with the Hong Kong Monetary Authority (HKMA) and the Hong Kong Applied Science and Technology Research Institute (ASTRI), the Fintech Career Accelerator Scheme (FCAS) was launched to provide students with plenty of opportunities working at FinTech start-ups and gaining practical skills. Under the scheme, undergraduate and postgraduate students can take up 3-month, 6-month or 1-year full-time internships at banks, stored value facility operators or the HKMA to work on FinTech-related projects, with technological training and regulatory briefings provided by ASTRI and the HKMA respectively. Around 200 positions are available in the 2019/2020 intake. A smart city is a municipality that uses information and communication technologies to increase operational efficiency, to share information with the public and to improve both the quality of government services and citizen welfare. More details of the internship programme will be announced in due course. The E-sports Talents Internship Scheme is the new initiative programme, which aims at providing solid work experience for students or graduates to work in the e-sports / digital entertainment industry. Application details will be announced in due course. Should you have any questions about our internship programmes, please feel free to email to internship@cyberport.hk.